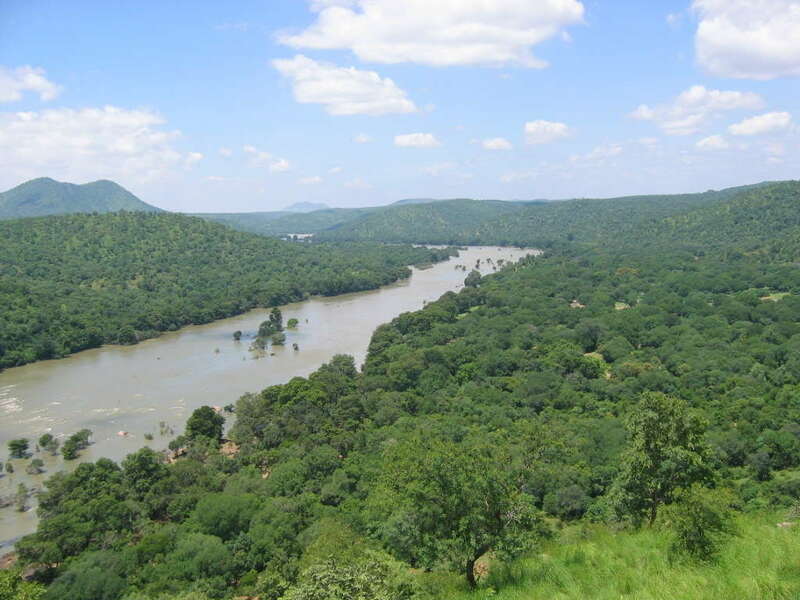 This legend is of the river Cauvery and how it started flowing in southern India. To celebrate the glorious and auspicious marriage of Lord Shiva and Goddess Parvati, all the gods, goddesses and sages (Rishis) gathered at Mount Kailash, Himalayas. This mammoth gather caused the northern land to dip. Lord Shiva asked the renouned sage Agastya (Agastya transliterated as Agathiar, Agasthiar and Agastyar. He is one of the Saptarishis) to travel to the south to stabilize this imbalance. He was told travel to Podhigai ranges in the southern parts of India to complete this task. Sage Agastya was deeply saddened because he would not be able to witness Lord Shiva’s union. Lord Shiva, known for his gentleness and understanding towards his devotees knew what was in the divine’s sages mind. He told him that he would still be able to see the wedding celebrations from the south. Then from his matted locks, Lord Shiva took the river Cauvery and filled it in the sage’s kamandal (a metal pot with a handle, always carried by sages). The Lord told the river Cauvery to flow where ever the sage pointed. Bidding farewell to the Lord, sage Agastya travelled to the south and went to various pilgrimage sites of Lord Shiva. Unknown to the sage, there were other events taking place in the south. A demon named Surapaduman had terrorized the gods, especially Lord Indra, the king of gods. Lord Indra was forced to leave his kingdom, Indralok and took refuge in a place called Sirgazhi where he prayed to Lord Shiva for help. He created a maginificent garden and worshipped him with the flowers from his garden. The god of wind, Lord Varun too was frightened with the power of the evil Surapaduman and didn’t bring the clouds to shower rains in this region. There was drought and the flowers of Lord Indra’s garden wilted away. Helpless, Lord Indra was deeply distressed that his prayer to please Lord Shiva was interrupted. Sage Narada couldn’t see Lord Indra’s despair and told him about how the river Cauvery was in sage Agastya’s kamandal. Lord Indra didn’t know how to seek the sage and get him to release the Cauvery River so he prayed to Lord Ganesh. Lord Ganesh, ever so loving, took the form of a crow and flew to sage Agastya and sat on his kamandal and toppled it. The sage raised his hands to shoo the crow and river Cauvery thought that it was a signal to start flowing and she did. The crow then took the form of a small boy. The sage didn’t know it was Lord Ganesh and tried to strike him on his head with his knuckles. Suddenly, the boy changed his form and the sage came face to face with Lord Ganesh. He realized what a sin he was committing; he was trying to strike the Lord. In repent, he began striking his forehead with his knuckles. Lord Ganesh stopped him and said whoever prayed to him in this manner would be blessed with wisdom. Another version of this story is that river Cauvery previously known as Ponni was disrespectful to sage Agastya and he punished her by trapping her in his kamandal. Sage Narada requested Lord Ganesh to free the river and so he took the form of a crow and toppled the kamandal. After this incident, the river Ponni was given a new name Cauvery also spelled as Kaveri.